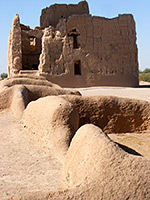 Casa Grande Ruins National Monument contains an imposing 4-storey building dating from the late Hohokam period, probably 14th century and contemporary with other well preserved ruins in Arizona such as the Tonto and Montezuma Castle monuments. It is situated in the flat plain of central Arizona in between the Gila and Santa Cruz rivers, just north of Coolidge and about 15 miles from the larger town of Casa Grande. The structure was once part of a collection of settlements scattered along the Gila River and linked by a network of irrigation canals. The area has a low elevation and hence is very hot - often over 110°F for several months in the summer. During spring, this part of Arizona is sometimes the hottest place in the whole USA, and even in winter, daytime temperatures can reach 80°F. The nearest major towns with hotels close to Casa Grande Ruins National Monument are Casa Grande (22 miles), Chandler (30 miles) and Marana (45 miles) - follow the links for hotel descriptions, photographs and reservations. The approach to the Casa Grande Ruins from any direction is along straight roads across dusty farmland; Highway 87/287 runs past the entrance, 15 miles east of I-10. The monument is open from 9 am to 5 pm each day, and has a good visitor center with much information about the Hohokam people. 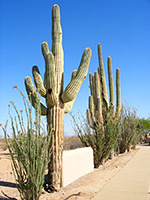 Outside are a number of large specimens of desert plants, including the ubiquitous saguaro, and also a shady picnic area with an entertaining ground squirrel population. A door at the back of the visitor center leads to the Casa Grande itself, at the middle of a rectangular area that used to be a walled compound containing several other smaller buildings (see 360 degree panorama). The 'Great House' can be seen from some distance away owing to the flatness of the terrain, and has a rather curious appearance from afar as the structure is protected from the harsh desert sun by a large metal roof supported by four great pillars, designed by architect Frederick Law Olmsted Jr. This is an impressive design, and is certainly necessary to help preserve the building but it is still rather incongruous. The present cover replaced an earlier wooden construction in 1932. The scale of the ruin is best appreciated from close up - it is 60 feet by 40 feet wide at the base and has caliche walls over a meter thick. Although visitors are not allowed into the building owing to its delicate state, much can be seen from outside including details of the construction with wooden beams supporting the clay walls, and various internal features such as stairways and windows. However, besides the protective canopy, the interior contains other modern items such as re-enforcing beams, metal ladders and measuring devices on the walls, all contributing to the slightly unnatural scene. It is believed that the Casa Grande functioned partly as an astronomical observatory since the four walls face the points of the compass, and some of the windows are aligned to the positions of the sun and moon at specific times. There are various smaller ruins in the complex, remains of a Hohokam farming village, and some are yet to be excavated. A second, similarly sized compound is located 850 feet northeast of the Casa Grande, though this is usually closed to the public. Nowadays, the roof and walls of the main building provide shelter for several species of small birds but the Hohokam themselves seem to have abandoned the complex around the 16th century, as part of a general decline in their civilisation. Apart from other Indian peoples and Spanish missionaries, the area was not revisited until the 1880s, when American settlers arrived and began to threaten the ruins by removing artefacts as souvenirs. 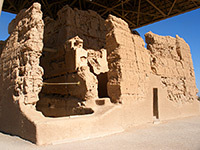 In 1892, the Casa Grande became the first archaeological site in the USA to be protected as a national monument.